A native species of river banks and floodplains in our area, but also escaped from cultivation and widespread along railroads and roadsides, in fields and fencerows, at old homesites and vacant lots, and in other disturbed places; found in both wet and dry ground. 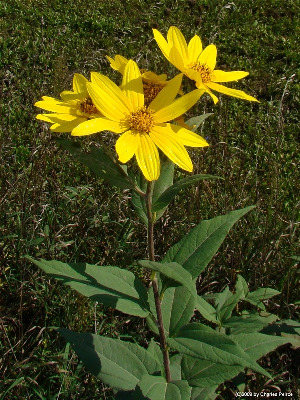 This sunflower was once grown commonly for its crisp tubers, produced on the rhizomes, which can be eaten raw or cooked. Fragmentary specimens lacking information on habit of underground parts are easily confused with H. annuus, but the latter has larger heads (on all but very small plants) and a tendency to relatively broader leaves. MICHIGAN FLORA ONLINE. A. A. Reznicek, E. G. Voss, & B. S. Walters. February 2011. University of Michigan. Web. April 21, 2019. https://michiganflora.net/species.aspx?id=359.